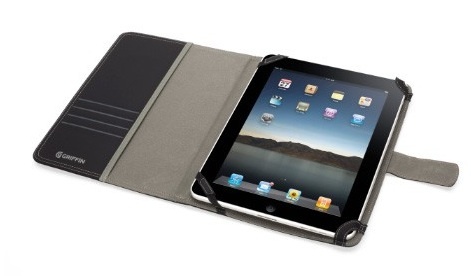 We just came across a sale on one of the ‘classy’ iPad cases we have around the office. The model on sale is the version for the original – Regular 49.99, on sale till the 30th for $11.99!! The design is two solid corner tabs and two elastic corners so the iPad is held pretty well in place while still able to remove when needed. The case is much thicker than the Apple magnetic cover but the Griffin Elan Passport is slimmer than many of the other professional looking cases available. Oh yea, and the Griffin Passport case is available in more colors than just classic black and brown too.